A fantastic example of a beautiful 1930s Art Deco china cabinet. This cabinet is in lovely condition for its age with very little wear and tear. It has three internal glass shelves, and is ideal for displaying china of this period. This beautiful piece of Art Deco furniture would be ideal for any collector of classic Art Deco furniture. We stock a wide range of both antique and vintage pieces of furniture which would complement this stunning Art Deco china cabinet. Please see our other listings for further details. 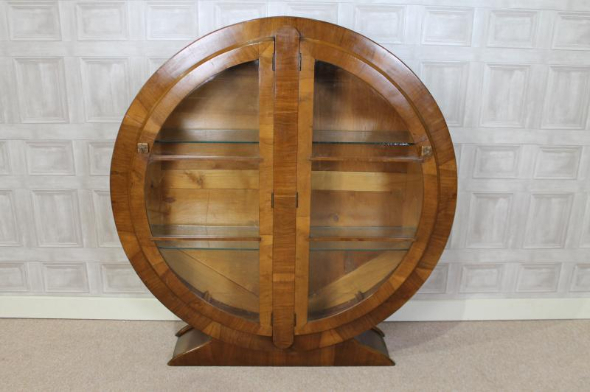 If you would like any further information about this 1930s Art Deco china cabinet, please call us on 01543 375872.